• Social rank: Facebook friends and fans as well as Twitter followers. 1. Better writing: You are writing articles that are wanted by the readers to solve their problems or answer their questions. Your writing improves in quality and quality over time. You write and post regularly and consistently as expected by your readers. 2. More comments: When you get more comments, it means you have touched on the feelings of the readers on a common subject that they want to share their views with you. More comments mean your articles are effective. 3. Traffic Rank: More page views and more unique visitors will get you a higher Alexa Traffic Rank. It means your article is using the right keywords to get noticed by search engines. It is also to say that you are writing the kind of articles that people are looking for. 4. Higher Technorati Authority: Among other things, it measures how often a site produces content being referenced by other sites. Do guest postings and participation in blog carnivals are two ways to get better Authority ranking. 5. More blog followers: Are you having followers to your blog? A lot of followers mean others like what you are doing and they want to follow you to see your daily update. 6. More guest postings and more articles accepted by blog carnivals: It is an indication that your articles are of good standard to be accepted. All these are one way link to your blog. 7. Social networking sites: Do you tweet your articles? I do and I get more followers this way. I write on the wall of Facebook about the posting of my articles. My friends will follow the article links to check out my posts. 8. More RSS and email subscribers: This is the real sign of a successful blog. It is measured by the number of subscribers you have. The more subscribers to your blog, the more successful your blog is. Your writing is so good that they want to have more of the same from you, therefore they subscribe. 9. Higher Google PageRank: Good articles attract like-minded people to link to you. The more links from high PageRank blogs in similar niche will boost the PageRank of your blog. Unfortunately after blogging for close to three years my PageRank is still 0. However, another blog of mine, Credit Card Lighthouse, which I have not updated for quiet a while has got a Page Rank of 2. 10. Adsense earnings: Your success is also measured by your earnings on the Net. Sad to say that it takes me six month to earn US100.What about you? Are you getting success in blogging? Look carefully at the key indicators. Rejoice if are on the right track. If not, you have to work harder. 1. Health Benefits: According to an article from MayoClinic.com Positive thinking: Reduce stress, enjoy life more, positive thinking may provide increased life span, lower rates of depression, lower levels of distress, greater resistance to the common cold, better psychological and physical well-being, reduced risk of death from cardiovascular disease and better coping skills during hardships and times of stress. 3. Problems: A person with positive thinking finds problem solving interesting. He will employ his creativity and resourcefulness to solve each and every problem. 4. Outlook in Life: Positive thinking means looking at the bright side of things and also able to see light at the end of the tunnel. To such a person life is hopeful. 5. Connection with people: He looks for the positive aspect of other people and he admires and appreciates their strengths. He is also trying to learn a few things from them. 6. Boost confidence: A positive mental attitude carries a can-do attitude. It means there is self-confidence in getting things done. 7. Boost self-esteem: Self-confidence promotes a positive image of self. He values and appreciates himself for what he is and what he can do. 8. Boost success: A person with positive thinking is more likely to achieve success with positive emotions than someone who is not. You see a glass as half full rather than half empty. 9. Boost creativity: Positive thinking means possibility unlimited. A person will imagine and conceive ideas to solve problems or get things done more effectively. 10. Promote happiness: Happiness and positive thinking go hand in hand. Happiness promotes good feelings and a good feeling creates positive thinking. Positive thinking is the right way and the only way to face obstacles and problems in life. 1. In the mood: Happiness puts you in the right frame of mind in your daily life. You are excited to live life and take quick action to get things done. 3. At work: You get satisfaction out of your job. Your work is fulfilling, challenging and interesting. You are enthusiastic and full of energy at work. 4. At play: You are relaxed, joyous and experiencing a delightful feeling. In other word, you play hard just as you work hard. You really get the kick out of the fun and enjoyment. 6. Your appetite: Happiness promotes a hearty appetite. You enjoy your meal; you eat slowly to savor each mouthful. 7. Your health: There is no true health without happiness. Happiness enhances good health, strengthens your immune system and promotes healing. 10. Other people: You smile at people you meet and you also bring happiness to others when you are happy. You are likeable and others enjoy your company. 2. Welcome problems: A good worker enjoys problem solving: He does not look at a problem negatively or something of a nuisance. “How can I solve this problem” is his way of response. In this way his creativity and resourcefulness start to work in his mind. 3. Creative: A good worker is creative and resourceful to look for better ways of doing things. His mind is always looking at things with a different perspective and to discover new methods to get things done more efficiently. 4. Inquisitivenes, curious and the thirst to learn and know more : It is the nature of creative worker to be curious and the urge to find out new things and how things work. By knowing more he is able to employ what he has learnt to do a better job. 5. Learn from experience: A good worker is able to learn and apply from previous experience and past knowledge to do his job. He is able to see the connection between old ideas and new situations. 6. Plan ahead: A good worker start a new day by spending a few minutes to do a little planning. He will identify those tasks which are important and get to do them first thing in the morning. Advance planning and mentally rehearsing what he has to do is the hallmark of a good worker. 7. Emotionally intelligent: Another great thing about a good worker is that he will not show his negative emotions at work even though he has personal problems troubling him. He goes to work in a positive mood as usual. 8. People friendly: He is empathy and able to know the feelings of others. He is willing to listen attentively and offer help. 9. Happy: A good worker behaves cheerfully and greets people with a smile. His positive outlook projects an image of likeability and confidence to others. 10. Communicate effectively: A good worker knows that the right time to ask questions is before doing a job. It is to clarify doubts if any. He will not do things to catch others by surprise; he gives sufficient notices in advance like taking a day off, coming to work late or leaving the workplace. A good worker is a smart and intelligent worker who does the right thing efficiently and at the right thing. 1. Read: Read to understand complex ideas and to find out the facts from information provided. Read with a critical mindset. The more you read the more knowledge you will possess. Knowledge is power, there goes the saying. 2. Learn: Your past experience has made you a much wiser person. However, it is good to carry on learning new things to broaden and feed your mind. The more you learn, the more you know and the more resourceful you will be. 3. Connect: Learn from others, be open-minded and find out their views on certain subjects. It is interesting to note that others may not share the same view on a subject. Different ideas from others stimulate your thinking. Be aware of current events so that you can talk to others meaningfully. 4. Observe: Seeing is believing. See for yourself how things get done Find out how you can apply what you have observed to your advantage. As an example observe the people in a mall to find out what is the current fashion trend. 5. Research: It is about finding facts and information about a subject that you are deeply interested. The next thing and the most important thing is to discover new facts and original ideas from the existing sources of information. 6. Write: Writing develops intelligence. Writing implies that before you write you read widely about a subject and do research to look for new ideas. The more you write the more creative and witty you will be in your writing. It means you are able to express an idea differently; it is unique and it is original. Write often and write every day to sharpen your intellectual capacity. 7. Create: Welcome problems. These are opportunities to be resourceful and creative to come up with solutions to solve problems. It is another way to exercise your brain. Problems make you smarter. According to Art Costa, the author of The School as a Home for the Mind, some of the hallmarks of intelligent people are persistence, flexibility of thinking, inquisitiveness, curiosity, the enjoyment of problem solving, using all the senses, ingenuity, originality, insightfulness and creativity. Are you one of them? 2. Getting retrenched or out of work: Being out of work is not only hurting you financially but your health and your self-image are also dealt with a heavy blow. 3. Failed business venture: Nobody can guarantee that every time you go into business you will be successful. When it is not doing as expected your initial capital will also vanish in thin air. 4. Failed investment: Do not be gullible and listen to get rich quick schemes. In most cases they are too good to be true. It is also possible that you have chosen the right investment but you have gone in at the wrong time. The worst thing that can happen to you is during a worldwide financial meltdown your investment is worth very little or no value at all. 5. Without a financial plan: When you don’t have a budget it is very likely you will overspend. It means you will get into debt and it may lead to bankruptcy. Budget and live within your income is the only way to avoid a money crisis. 6. Impulsive credit purchases: It is the sure way to get into a quick financial crisis by charging your credit cards to buy what you want to enjoy instead of essential items only. 7. Gambling: It is a bad habit doomed to cost you a lot of money or all of your wealth and in the worst scenario, your life as well. According to expert you should be keeping about three to six months living expenses as emergency fund. In the event that one of the above crises strikes and you are unable to be productive, the emergency fund will be mobilized to take care partially if not all of your expenses during the devastating period. Those without financial planning and using credit card freely are unlikely to have an emergency fund. Emergency fund will not help habitual gamblers. If they don’t kick the habit no amount of emergency fund can help them. 2. Dream big: Follow your aspiration and inspiration. It is said that when your reach for the moon and if you do not succeed you will still be among the stars. Aim high to achieve more. 4. Take the first small step: Your first step is a giant step. Take the crucial first step with courage and with no hesitation and procrastination. The most important thing is to keep moving and make it a daily habit to do what is necessary to reach your goals. 5. Be determined: Don’t listen to others who try to pour cold water and discourage you. Be focus by looking at your written goals every day. Go for your dreams no matter what. 6. Be persistent: Be diligent to get things done daily. It is the daily effort that makes your dream a possible dream. 7. Be willing to go for the long-haul: There is no instant success. The only way to be successful is through your blood, sweat and tears over a long period of time. 8. Be confident: Do not be discouraged by setbacks and defeats. They are just part and parcel of making progress in life. Just learn some valuable lessons from the experience and move on quickly. 9. Be motivated: Look at your daily achievements. Congratulate yourself for getting the most important things done. It is a step closer to your dreams. Carry on and do your best. 10. Be happy: The wonderful thing about happy people is that they are more successful than those who are not. They are cheerful, positive minded. Happiness also promotes good health. Always remember to start a new day with cheerfulness and look at yourself in the mirror with a broad smile. Life is worth living when there is something to do, something to hope for and something to achieve. One effective way to relieve tired eyes is to apply pressure on the pressure points on both sides of a thumb by using the other thumb and your finger tip. For those who are always glue to the computer screen it is a wonderful way to sooth the tried eyes and improve your eyesight. You can do it several times in a day. 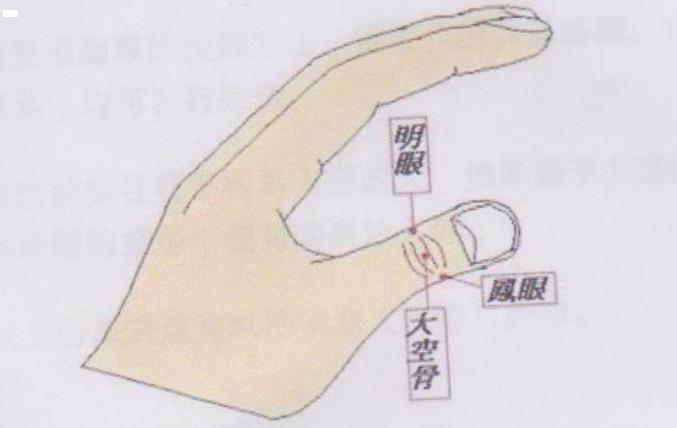 There is another pressure point on top of your thumb. Be warned that if you feel painful when you apply pressure on this point, it is an indication of serious illness. You should continue to apply pressure to remove the pain and clear the blocked flow of energy. The way to do it is to apply firm finger pressure to stimulate these three pressure points at any time when you are free. Do it on both thumbs. I have tried and it is effective. Now I am doing it every day. Another great way to relieve tired eyes is to massage the areas surrounding the eyes. • Get moving daily to improve your stamina, strength and suppleness. • Take breaks between tasks to avoid stress. • Pamper your body with a spa treatment or massage. • Unwind by listening to music or enjoying one of your favorite pastimes. • Sleep well at night in order to regain your energy and repair damages done to your body after a stressful day. • Do deep breathing exercise. • Eat your breakfast every day and enjoy your meals by eating slowly. • Eat less but more frequently. • Avoid junk food and the three whites (white bread, white sugar and white rice). • Avoid food added with preservatives and additives. • Avoid acidic foods and eat more alkaline foods. • Give up smoking and drink moderately. • Drink a lot of water every day. • Eat more fruits and vegetables. • Avoid polluted environment and second-hand smoke. By taking care of your body physically and eating right you will strengthen your immune system to guard yourself against infection and avoid toxins. However, your mental, spiritual and emotional well-being are the other three pillars essential to fight against the unknown factor of cancer caused by a mental state. • Think positively and be confident of yourself. • Look at the bright side of things. • Live in the moment, don’t think of the past regrets or worry about the future. • Exercise your brain by continuous learning. • Physical exercise is not only good for your body but promotes your concentration and memory as well. • Do not be discouraged by defeats but bounce back. Be resilient. • Do yoga or Tai Chi to meditate. • Develop a sense of peace and calmness in your mind. • A clear conscience will promote a peaceful soul. • Donate to worthy causes. • Do random acts of kindness. • Make the best use of what you have and be contented. • Start a new day cheerfully and hopefully. • Feel good about yourself and be happy. • Be aware of your emotions. • Able to control the outburst of negative emotions such as anger, resentment and hatred. • React positively to negative events; find a solution instead of dwelling on the problem. A positive mindset and a healthy lifestyle are the best way to fight cancer. Advance planning: It is an essential activity to identify, organize and prioritize those important things to do in advance. A well-organized day is a day which can be executed smoothly, unhurriedly and without stress. To-do list: Do not commit to memory things that you need to do. Your brain should be used only for creative purposes only. The list directs your attention on the most important things to be done for the day. It is also an effective way to follow the 80/20 rule. It is doing 20% of the work to produce 80% of the results. Take breaks: Take a deserving break upon completion of a task by having a cup of coffee. A break clears and relaxes your mind and allows you to regain your energy so that you can go back to work with a calm mind and full concentration. Another great way to take a break is to go away and do sightseeing. It is a marvelous way to broaden your mind and to learn and understand new places and new people and their cultures. Do less: Don’t fill a day trying to do more and get stressful. The R.E.A.L way for an effective simple living is to eliminate those non-essential and unimportant issues and automate those essential things and enjoy fully doing what you like to do. Be happy: Start a new day with a cheerful disposition. Happiness promotes good health and vibrates more positive emotions. You attract the attention of others because you project an image of friendliness and self-confidence. According to research, happy people are more successful than those who are not. Time to move your body: While happiness contributes to health, exercise also generates a happy feeling in you. Your robust energy and your alertness can only be achieved by regular physical activities. Time to follow your dreams and passion: Doing things that are important and meaningful to you are the core activities of a simple life. A simple life is not doing nothing but more of the things that bring you satisfaction, fulfillment and well-being in life. Time to be with your family: A family unit is the core value in relationship. Nothing beats the peaceful and harmonious existence of a family life. Success means nothing if you have a broken family. Time to be alone: Allocate a time to be alone and to reflect. Take stock of your life and find out if you have really lived a simple and productive life. We live in a complicated world; go for a simple and productive life. Do it the first time and the last time: Handle documents once only. Decide immediately to act on it, to throw it or just to file away. De-clutter: Discard or give away things you don’t need or use anymore. Make your house spacious. A tidy and uncluttered home attracts the flow of positive energy. You will feel calm and peaceful at home. Deliberate and decide: Study carefully about making a change in your life. Weigh the pros and cons of it. Will it be beneficial to your simple life? Deliver immediately: In the office, if an interruption occurs such as a request for something. Do it right away if it does not take you more than five minutes. Just be done with it once and for all before you forget and get the blame. Distinguish: React intelligently to new things that enter into your life. Will it complicate or simplify your life? Decide and act. A simple life is a happy, rewarding and fulfilling life. Record: Record your daily activities during a normal week. Find out how you get things done in the office, what you do in the evening and at the weekends how you spend your own time. It is like a time log. From the record you will see clearly the things that you do to fill up the 24 hours in a day for the whole week. Live: After eliminating the small staff and automating those essential items, now you can live life your way. You will have the time to do things that mean a lot to you in life. Follow your dreams and passion. Spend quality time with your family. Connect with those people you care about. Spend time reading and learning which you have neglected in the past. Do exercise to shape up your body. Slow down to marvel the wonders of nature. In the office you have more time to use your creative faculty to look for better ways of getting things done more efficiently but no less thoroughly. You follow the rule of 80/20 to concentrate on 20% of your work to produce 80% of the results. Can you think of a better way to live a truly simple life? Please share with us. Friendly: Treat the customers like your friends but be polite. Talk and find out more about what they want and their preferences. Ask and obtain feedback from them. Initiative: Empower the front line staff to do whatever necessary to meet the needs of the customers. There should be no delay in dealing with your valued customers. Responsive: Listen carefully and take promptly action. Be sensitive to the requests of the customers. Sincere: Take a genuine interest in your customers and treat them with a kind H.E.A.R.T Do not over promise and under deliver. Be efficient and reliable to honor your words. Tactful: Customer complaints are to be handled immediately. Do not be defensive and be ready to admit your own mistakes and offer to take remedial action. Look at a complaint positively. If your can resolve an issue to the satisfaction of a customer, he or she will be even more likely to do business with you. If there is a genuine problem, you should be thankful to the customer for pointing it out. Be ready to match your products to meet the requirements of the customers so that you offer value for money. The most important thing is to provide superior services to your customers the F.I.R.S.T. time and every time. 1. Achieving your dreams: The most thrilling thing in life is to achieve your long-term goals. It is your vision and passion. You will face many challenges in life It is not easy but you are determined to pursue your objectives. As an example, I want to be a better blogger. I know it is an uphill task. I am passionate about it and I will go for it though it may take me many more years. 2. Financial freedom: This is another meaningful long- ranch goal. It means you are able to realize your financial objectives such as owning your own house and having sufficient fund for retirement and children education. 3. In the pink of health: How well you live in life depends on how fit you are. Life is only worth living when you have the energy and drive to go after your dreams. Exercise daily for health and fitness. 4. Simple random acts of kindness: This is the right way to live. Be patient while you are driving and give way to those who want to overtake you. Stop and let the pedestrians cross the road. Greet people with a smile and give praises and pay compliments generously. Say please and thank you. These kind gestures don’t cost you a cent, but they mean a lot to other people. 5. Family: Caring and rearing children are never easy. Maintain harmony at home is also a challenge. Just live one day at a time and don’t worry about the future. Look at life positively in all circumstances. 7. Learning: Enlarging your intellectual capacity and learning new insights and keeping your mind active and stimulated are the advantages of continuous learning. Learning new things is also a lifelong process. 8. Reading: Reading motivates, captivates, uplifts, refreshes, excites, moves and encourages you in life. Make it a habit at least to read a page a day. 10. Giving and contributing: Share your experience, know-how and knowledge with others. Give to the needy and donate to worthy causes. These are the things you continue to do day after day. These are the things that give you meaning in life. 4. Connection: Be connected and be in touch often with those sharing similar interests with you. Tap into their resources and see how their ideas can be transformed to suit your own needs. 5. Self-confident: Be optimistic of what you do. Don’t be discouraged by defeats and failures along the way. These are great learning experiences to make you a wiser person. 8. Emotionally intelligent: Knowing your own emotions is to prevent yourself from doing the wrong things or saying the wrong words at the wrong time. Knowing the emotions of other means knowing the right time to approach them and getting things done. 9. Be happy: Happy people are more likely to be successful than those who are not. The fact is that your pleasant personality attracts the attention of others because you are cheerful and meet others with a smile. You create a positive self-image that people assess you favorably. 10. Take action: You may have all the other parts in working order and you won’t take action, nothing is going to happen. The most important thing is to act promptly. Strike while the iron is hot, do not dilly- dally or your will miss a golden opportunity to take your success to the next level. Taking action means working hard and working smart on those things that are important in your life. When the system is in working order, you will accomplish what you want to achieve in life. What are the other things that can promote happiness? Please share your thoughts here. 1. Creative: A free and uncluttered mind is the prerequisite to creativity. Happy people feel good about themselves and they are always looking for better ways of doing things. .Their mind is on the job and they are thinking about how they can work more efficiently. 4. Likable: Others are more attracted to people who are happy and cheerful. Happy people make those around them happy too. It is a conducive environment to get things done smoothly. 5. In the mood: They are always in a positive mood to take prompt action and go to work right away. 7. Positive outlook: They are not disturbed by problems at work. They accept them as part of their routine and they are resourceful to think of ways to resolve the issues. 8. Work with a more relax mind: Happy people don’t work under stress. They are cool, calm and collected at work and they have more energy, more alert and make fewer mistakes. 9. Happy in what they do: They are engaged and passionate to do what is expected of them. They do a thorough job the first time and every time. 10. Motivated and inspired: As happy people have achieved more success than those who are not, they are motivated to perform better than before at work. The most important thing in life is to find happiness at work. Do something that you are interested in and passionately about. A happy worker distinguishes himself as a better worker from someone who produces mediocre work. Success: According to happiness expert, Sonja Lyubomirsky, happy people are more successful in life than those who are less happy in terms of career, family, relationships, work performance and income. They are always in a positive mood to achieve what they have aimed for in life. Well-being: Happiness promotes goodness physically, emotionally, mentally and spiritually. There is a good feeling lingering in the air among them. Furthermore, robust health, in turn, generates more pleasant feelings in them. Likable and sociable: People are naturally inclined to approach those who are cheerful and friendly. Happy people are glad to meet others. They are well-connected with friends and relatives and they enjoy great support from them. Attract good luck: Happy people attract the attention of others because they are cheerful and greet people with a smile. They feel good from the inside out and they project an image of self-confidence. Optimistic: Happy peoples have a positive perception of themselves and they have a positive outlook in life. They have high expectations and high hope about the future. Making others happy: Happiness is infectious. When you are happy you make others happy too. Satisfied at work: Happy people are excited about their work. They are engaged and passionate to do their best. As they have experienced happiness and success they will look for new goals to work on energetically. Peaceful and harmonious home life: Happy people bring happiness to their home life. Family members are influenced positively by a smiling face to greet them at the door. More positive emotions: Happy people vibrate more positive emotions such as assurance, hopefulness, excitement, contentment, friendliness, satisfaction and kindness. They live in the moment and they enjoy what they have got out of life. Happiness is something you don’t have to look for it, earn it or buy it. It is free and it is a feeling from within. All you need to do is to make a simple decision to be happy. Can you make up your mind to be happy and stay happy? Do work that you are interested in: If you do not enjoy doing your work, most likely you can’t be engaged, committed and be focused on the job. It is like a round peg in a square hole. Do work that you are passionate about so that you can do well. Explore new ways of doing things: Be creative and resourceful to find new ways of doing things so that you can be more efficient and effective. When you can do a better job, you are definitely motivated. Keep learning: Be keen and curious to look for new things to learn. The more you know the more resources are available to you to solve problems at work. Go slow: Rushing about is the sure way of getting stress and discouraged. Avoid pressure by following your to-do list and take breaks between tasks. Celebrate daily accomplishment: At the end of each day remember to review things that you have completed according to your to-do list. Congratulate your effectiveness in getting things done so that you keep yourself inspired. Positive emotions: Are you emotionally intelligent? You must be able to know your emotions in order to avoid expression of negative emotions like anger, resentment and hatred. Get to know the emotions of other people so that your can approach them when they are in the right frame of mind. In this way you get things done smoothly through others. What else excites you: A happy home life and the pursuit of personal interests can make a positive impact on your job. When you are happy about other things in life, it will bring cheerfulness and satisfaction into your working life. Look after your health: When you are unfit, you don’t have the drive and energy to work. You can’t be motivated when you are feeling down and out. Exercise every day to be in top form, alert and feel good about yourself. You spend one-third of daily life at work, it is important that you are happy and motivated at work for many more years to come. 1. Television: You change your life forever on the day you stop watching TV. The time you spend on gluing to the tube can be used to do so many wonderful and productive things in life (link to my article). The fact is that doing anything else is better than watching TV. 2. Mobile phone: Actually the basic function of telephone is to communicate important messages. Now, with the invention of mobile phone it is used to send text messages on trivial issues just to pass the time. Worse still, it is use to browse the Net for the sake of browsing. 3. Internet: Internet is a useful tool when it is used correctly to look for information or doing things relating to your job. Don’t do emailing or chatting for no purposes at all. Surfing the Net is another great sin. 4. Time stealers: Avoid getting into a situation to allow someone to bump into you and chat endlessly just to take away your valuable time. Send him or her to the door politely. You have better things to do in life and time is short. 5. Newspapers: If you must read the papers all you need is about five minutes to scan the headlines. A headline tells the whole story in a nutshell. I read as fast as I can just to look for ideas for my articles and nothing else. Newspapers carry all the sensational news that dampen your spirits and discourages you to start a new day right. 6. Multi- tasking: Don’t do so many things at the same time in order to save time, it is counterproductive. You work under stress and you are prone to mistakes and you can’t concentrate. Focus on one task at a time to do a job right the first time. 7. Not prepared: Not getting ready the material to do your job is courting for trouble. You will start hunting high and low for the tools and other necessary items. It is time wasting and frustrating. 8. Do not plan ahead: It is yet another way to waste time by not planning ahead. You could waste precious time doing the wrong things which are not important. 9. A late starter: Time is more than wasted when you start a new day late. You will be rushing about to get things done badly. You miss deadlines and you get interrupted by people and phone calls. It is a mess. Start a new day early. 10. Aimless living: This is truly a disaster in living a meaningful life. Don’t drift around aimlessly in life. It is more than a waste of time. It is a drain of energy and resources. Set goals and follow your dreams. Actually when you look the list, these are things to avoid so that you don’t waste time. You will gain more time at your disposal. The rule is to spend more time on your goals and objectives and avoid doing things that have no impact on your life. Be adaptable and receptive: Be patient to understand, learn and accept new ways of doing things so that you will get used to it in the shortest possible time. Look at the benefits so as to embrace changes. Be flexible: Do not be adamant about your own ideas. Look at new things with a positive perspective. Find out how you can gain from the changes. Be open-minded: To learn new things you have to forget what you know. Welcome new things and new ideas to gain insight. Find out how you can adopt the new ideas in the area of your work. Be willing to learn from others: One advantage of learning from others is that other people’s ideas are the keys to your own creativity. The only worry is that other people are not willing to share their ideas with you. Be happy: Changes may be inevitable but you can choose to be cheerful and be confident of what you do at the workplace. Stay focused and find satisfaction in your role. Be able to accept constructive criticism: Do not be defensive. Examine the ideas carefully. Be willing to change for the better. Others will be pleased to know that you are a person of character. Be willing to accept other people’s ideas: Discuss new ideas with your boss and other workers. Be willing to accept better ways of doing things. Others will be pleased and willing to work with you. Be creative: Be willing to take the initiative to look for new ways of doing things to get better results. It means you get out of your comfort zone and make the changes yourself or else you will be the victim of change- your job is redundant and you are no longer needed. Be critical of new ideas: Do not accept changes blindly, be willing to speak your mind. Give reasons and offer solutions, attack the problem and not the person. 1. Listen to your favorite music: It uplifts your mood, energizes you and put you in a delightful mood. 3. Involve in your favorite interest: What is your passion: I enjoy the excitement of blogging. It is interesting to see how you fare with other bloggers in the blogosphere. 4. Savor your favorite food: In Malaysia your can enjoy a variety of local and western food. I like local food like Hainanese chicken rice, nasi lemak and roti canai. What food delights you? 5. Read your favorite motivational books/quotes: Get motivated by reading your favorite books and quotations to boost your confidence and raise your self-esteem. 6. Chat with your favorite friends: Get connected, share a few jokes with your best friends and laugh out loud. Exchange ideas about life and learn from each other. 7. Cherish your favorite memories: Think of your glorious moments and your achievements and let your past successes spur you to greater height in life. 8. Immerse in your hobby: What is your pastime? Gardening, Stamp collecting, drawing or playing a musical instrument? Get into a world of enjoyment. 9. Do your favorite exercises: I enjoy jogging. Jogging allows me to get in touch with nature and fresh air. It is good for health and fitness. How do you enjoy keeping fit and healthy? 10. Work on your favorite tasks: Are you happy at work? There must be certain tasks you enjoy doing. Be creative and see what you can do to make your work easier but no less thoroughly. This article is to highlight to you these are some of the things in life which generate positive emotions in you and make your life worth living every day. What are your favorite things? 1. Acceptance: Life is about encountering problems. Only those people in the cemeteries are without problems. So we should look at problems positively. 4. Prompt action: A very good example is debt. Don’t think that you can deal with it later. It will only get worse. When interest is added with more interest you will get into a situation that is beyond your control. Running away from a problem is a sure way of getting into more problems. 5. Problems at the workplace: When you face a problem, don’t pass it on to your boss. Solve it yourself and let your boss know, he or she will think highly of you and you will be more assured of yourself to solve bigger problems. 6. Trying is better than doing nothing: Don’t dwell on the problem, do something. Taking action is better than inaction. 7. Build confidence: Solving problems are a great way to boost your confidence. Each time you face a problem, you look at it as a challenge with a positive mindset. 8. Promote creativity: Welcome problems to sharpen your creative mind. The more problems you can solve the more resourceful and creative you will be. 9. Get help: Find out from others how they deal with problems similar to yours. Problems bring you excitement into your life. Let problem solving make you a more confident, resourceful and creative person.